With the sudden wealth that came with the oil price hikes in 1973, the country went on a car-buying spree. Motor vehicle sales exploded; the volume of cars imported doubled every three months. The demand was so great that Honest Ali of Manfuhah was smuggling in dozens of beat-up cars a week from Kuwait. Lebanese teenagers could pool their money, hitchhike to Germany to buy a used Mercedes and drive it to Jeddah to triple their investment and have a spectacular adventure in the process. The problem was that there were many more cars than there were halfway competent drivers. To make matters worse, very few even had a driver’s license, and the rest didn’t care and drove like madmen. “What…” and then I was called to read the eye chart. I read down the list far enough and the examiner, a cheerful, barely 20-year-old signed me off. Then Clem sat down. The kid asked Clem to cover his left eye and read the chart. Clem brought up his left hand over his eye and read the chart. The examiner asked him to cover his other eye, and Clem brought up his right hand and placed it over his left eye - the same eye. He read the chart and was on his way. I filed this item in my special techniques database in the sub-folder marked Misdirection and prepped myself for show time. We returned to the main hall which now seemed to teem with even more men waiting to approach the counter. At least eight guys deep. Londoners are famous for their queues, patiently waiting in a tidy line for the bus. Middle Easterners take a different approach and use the horizontal queue to mob the counter screaming and waving forms in the air trying desperately to get one of the half dozen officials to pay attention. The clerks are middle-aged Saudis in thobes and ghuttras, but by some miraculous life force are cut from the same cloth as DMV employees in San Diego, Paris or Istanbul. They begin their day bored to death, and it only goes downhill from there. It would be a great job if they never had to ever meet the public. The horizontal line method sort of works, eventually people clear out, and you can advance a step closer. However, you are standing in close quarters, so you must never step back or leave an opening between you and the fellow next to you. So I’m literally pressed shoulder to shoulder with Saudis on either side. I make some very small talk in my elementary Arabic, and they are cordial. In the rows ahead of us everyone is also tightly squeezed. Ahead at the counter, a scowling, very short Saudi about 30 years old is trying to leave directly through the rest of us packed together in a virtual sardine can. Finally, Shorty makes it to the row just ahead of me, but no one wants to step aside so he can get through. It’d be easy to lose your place. Eventually, he literally pries two guys apart enough to pass and steps through them. Almost instantly they close up, shoulder to shoulder, and catch the end of Shorty’s ghuttra between them. He takes another half-step before his head snaps back, and he falls to the floor. I don’t think that I’ve ever heard so many men from so many different places, speaking such a wild range of languages and dialects, laugh so hard at the same time. It was so contagious that even guys who hadn’t witnessed Shorty’s pratfall were laughing. The rest of the process wasn’t too bad. There is a bizarre etiquette involved in the horizontal method. As you approach the counter you wave your application in the air and shout. As you get closer, you keep waving but try to make eye contact and be empathetic, as if you cared about the clerk as a person. If you are Lebanese, you whisper to the official that he is so handsome that it is impossible that he is not a leading man in Egyptian cinema. It sounds more or less orderly, but there is a wild card. As slow as they are, the clerks do take some pleasure from being in demand, they take the closest application even if it’s from some guy stretching from the second row, they banter with applicants, and have that uncanny ability like waiters in certain expensive restaurants to walk through the dining room without seeing that the neglected Donner party of four at table nine has resorted to cannibalism. So they ignore the earnest besetments from a fellow like Shorty, and amuse themselves with the tall, willowy Somali with filed teeth or the fifteen-year-old Bedouin kid who will take his license and get his first job driving a Mercedes dump-truck loaded with granite boulders through the heart of the city at rush hour. This all worked in my favor. Being so tall I might as well have been the only American in the hall. Clem, about the size of an average Yemeni, was lost somewhere behind me. A great novelty at the DMV, I was a foot taller than almost everyone in the room, I could say “Hina! Hina! Here! Here!” as well as anyone else and wave my papers nine feet in the air. By the time I got to the third row, one of the clerks was waiting and with a big smile waved me on. I stretched over two men to deliver my application. He stamped it, and I was on my way into the then-world’s capital of vehicular injury and misery known as the streets of Riyadh. The highways that connected the city to the rest of the kingdom and the few boulevards, many of them freshly built on the outskirts, were about the only place where a driver could gain enough velocity to totally demolish his vehicle. There were few, but horrendous accidents. However, within Riyadh, at the traffic circles, at the stop lights, down in the old city is where the struggle was fiercest. Saudi drivers somehow decided that a two-lane road was actually meant for three cars abreast. Cab drivers and Bedouin considered a traffic light optional and sometimes one-way streets, too. One morning in central Riyadh, my brother saw an old Bedu in a battered Datsun pick-up truck harangue a police car into backing up, as he drove the wrong way down a narrow street shouting, “Haggi! My right,” all the way. Idling at an intersection one very warm afternoon, I realized that I was surrounded by physicists capable of calculating in real time that mass times velocity squared equals force, and ceding the right of way to the largest number. So our fifteen-year-old Bedouin kid with his new driver’s license, barreling down Batha street with a dump truck load of paving stones had carte blanche at the next stop sign. That’s an obvious example, but a more nuanced desperate game was fought between delivery vans and pick-up trucks, Pontiacs and Peugeots, Suzukis and Fiats. Traffic circles resembled the chariot scenes from Ben Hur on lots of caffeine. The swarms of cheap motorbikes had no right of way – ever, and survived as best they could, sometimes drafting behind the giant freight trucks and fuel tankers like remoras. I was lucky because I had started driving in the minor league city of Al Khobar before I was called up to the majors. 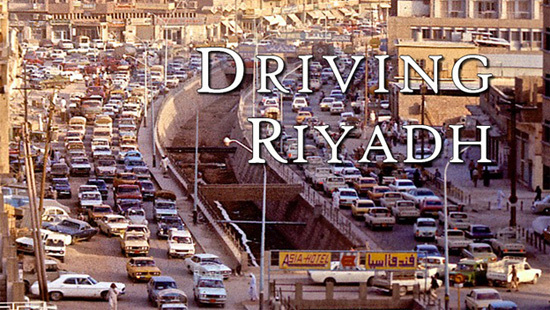 First in Riyadh, and then Jeddah, I learned the most fundamental truth about driving in Arabia, the US or anywhere else – they are all trying to kill you. And they believe the same about yours truly. Once that is realized, it does wonders for your driving awareness. Eventually, you understand that in dense urban traffic there are threats from all directions, so the best you can do is focus ahead, watch the width of your front fenders, try to not smash into anybody and abandon the side doors and the rear of your car to fate. I had a great job at the hospital, setting up its TV studio, programming the hospital’s three-channel closed-circuit TV network and organizing the operating room cameras into a smaller studio solely devoted to filming surgical procedures. But the real reason I was in Riyadh was to drive around Arabia. With my driver’s license in hand I set out to buy a vehicle that would get me there. A car was pretty much out of the equation. It would take me around the city conveniently enough, but the older streets could be suddenly treacherous. There was a stealth pot hole near the Al-Yammah Hotel that claimed dozens of front-end alignments a day. I wanted to drive into the desert anyway. There were a lot of pick-up trucks available, though the Japanese models were too compact for me, and I wanted a back seat. The vehicles most closely to what we now call a SUV were the Chevy Blazer and the Toyota Land Cruiser, but they were new and pricey. I was in the back of a cab going to the hospital when I heard the sound of big tires. I looked back to see destiny rolling up on my right.